Gastrulation converts the embryo from a two-layered structure having epiblast and hypoblast to a three-layered structure containing ectoderm, mesoderm, and endoderm. Elongates during POD 13–16: The primitive streak elongates toward the cranial end of embryo between POD 13 and 16. Full length by POD 16: The primitive streak reaches its full length by POD 16, covering roughly the caudal half of embryo in the midline. Regresses to caudal end by POD 28: The primitive streak begins to regress beyond POD 16 back toward the caudal embryo, ending up as the caudal cell mass at the caudal end of the embryo by POD 28. Throughout both elongation and regression, cells from the epiblast migrate toward the primitive streak and invaginate ventrally through the primitive groove. Formation of endoderm: During the elongation phase, prospective endodermal cells move toward the midline and invaginate through the cranial half of the primitive groove, displacing the hypoblast cells laterally and replacing them beneath the epiblast to form the definitive endoderm (giving rise to respiratory and gastrointestinal epithelium). Extra-embryonic cells ingress through the caudal half of the primitive groove and do not contribute to the embryo. Formation of mesoderm: During the regression phase the prospective endodermal cells are replaced by prospective mesodermal cells of the epiblast that invaginate through the primitive groove to form somitic (giving rise to somites), intermediate (giving rise to renal system), and somatopleural (giving rise to limbs) mesoderm on either side of the primitive streak between epiblast and newly formed endoderm. Formulation of endoderm and mesoderm: Epiblast cells that ingress through the primitive groove during primitive streak regression become prospective endodermal and mesodermal cells. From Dias and McLone (2). As cells from the epiblast are lost to the invagination process, the remaining epiblast cells spread out (a process known as epiboly) and differentiate to form the neuroectoderm (CNS) and the cutaneous ectoderm (skin). Hensen’s node represents the cranial terminus of the primitive streak, and the primitive pit is the cranial terminus of the primitive groove. Endoderm formation: During primitive streak elongation prospective endodermal cells ingress through the primitive pit as well as the primitive groove. 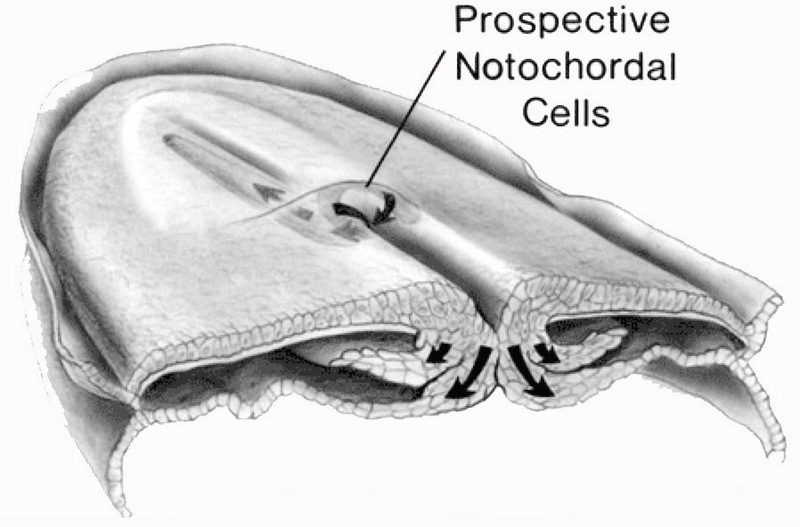 Formation of notochordal process: During primitive streak regression, prospective notochordal cells (which are also mesodermal in origin) ingress through the primitive pit and come to lie between the newly formed endoderm and neuroectoderm in the midline to form the notochordal process. Gastrulation and Hensen’s node: Ingression of epiblast cells from Hensen’s node into the primitive pit produces prospective notochordal cells. From Dias and McLone (2). Formation of notochordal canal: The newly formed notochordal process (POD 16) can be thought of as a hollow rod composed of notochordal cells radially arranged about a central lumen (the notochordal canal); the notochordal process is contiguous caudally with Hensen’s node, and the notochordal canal is contiguous with the amnion through the primitive pit. Notochord formation: The notochordal canal exists as a tube of cells radially arranged about a central lumen, situated between the dorsal ectoderm and the ventral endoderm, From Dias and McLone (2). Formation of neurenteric canal: The notochordal canal subsequently fuses with the underlying endoderm (a process called intercalation) beginning at approximately POD 22. This places the amnion in direct communication with the yolk sac through the notochordal canal; this communication, which lasts approximately 3 days, is called the primitive neurenteric canal (2). Neurenteric canal formation: From Dias and McLone (2). Involution of neurenteric canal: By POD 25 the notochordal process reforms, rolling up and separating from the underlying endoderm (a process called excalation), and becomes the true notochord. The primitive neurenteric canal is obliterated during this time. Involution of neurenteric canal: The notochordal process excalates from the endoderm, recreating the notochord and eliminating the primitive neurenteric canal. From Dias and McLone (2).